On a sweltering July day last summer, a customer made a remark to Ashley Dow that fundamentally changed the course of Sticky Sweet, the business she founded in January 2017 with her sister, Kelley Dow. The pair had spent the previous six months selling Thai-style sticky rice in three flavors from a stall in the Public Market House in downtown Portland. Then the heat hit. Her instinct was spot on. The Dow sisters whipped up a few batches of what they called sea salted maple to run as a special over the weekend. The dairy-free ice cream contained six mostly organic ingredients: coconut milk, cashews, Maine maple sugar, coconut sugar, coconut oil and Maine sea salt. Soon they created new flavors (local roasted latte; chocolate nutter butter; mint chunky chip), added gluten-free cones and began selling pints in local stores. These days the Dow sisters are working overtime to fill orders for the Portland Food Co-op, Lois’ Natural Market Marketplace in Portland and Scarborough, Frinklepod Farm in Arundel, Morning Glory Natural Foods in Brunswick, and Royal River Natural Foods in Freeport. Kelley Dow, left, and Ashley Dow founded the Sticky Sweet vegan ice cream brand last year. Kelley’s cone is mint chunky chip and Ashley’s is double dark chocolate. According to the Portland Food Co-op’s grocery manager Megan Banner Sutherland, the Sticky Sweet ice cream in the freezer case has brought in new customers who are looking for the frozen treat, which sells for $10.79 a pint. 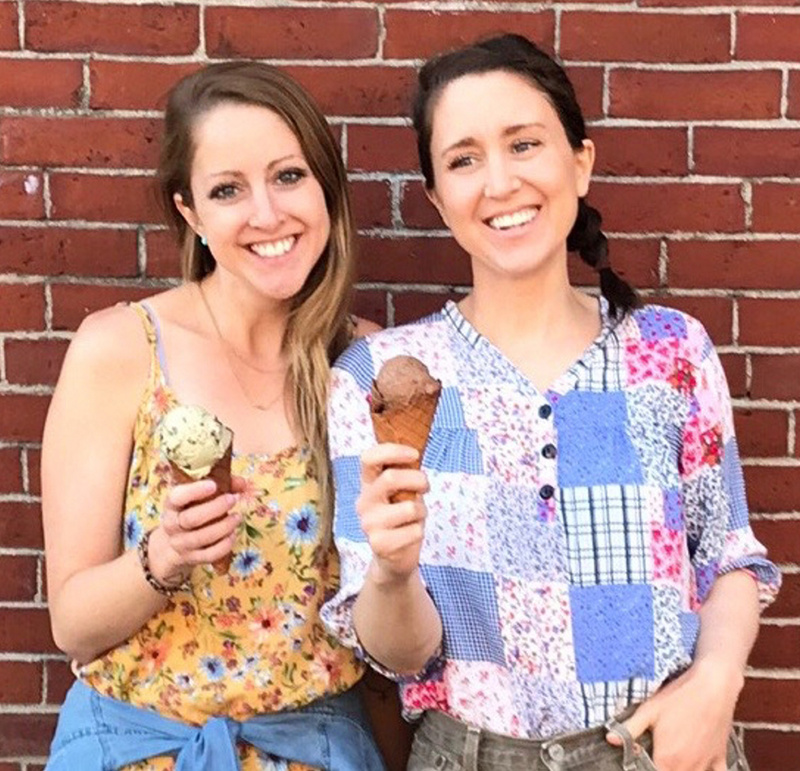 To keep pace with the surging demand, Sticky Sweet has closed its Public Market House stall, and the sisters are readying a scoop shop and production space at 119 Cumberland Ave., near Washington Avenue’s restaurant row. The success of Sticky Sweet reflects a wider interest in the ice cream market in plant-based flavors. Ben & Jerry’s, Häagen-Dazs, Breyers and Halo Top have all added vegan lines in the past two years. In May, Whole Foods Market launched a line of vegan ice creams under its house brand, 365 Everyday Value. Meanwhile, Trader Joe’s has been selling its own vegan ice cream pints for years. These new pints join established plant-based brands such as So Delicious, Coconut Bliss and NadaMoo! in the freezer case. The price of vegan pints is comparable to that of other premium ice creams, with those that contain organic ingredients commanding the highest prices. While Halo Top charges the same amount for its vegan and cow’s milks ice creams, Ben & Jerry’s charges $1 more for its vegan pints. Demand for plant-based ice cream is poised for further growth. A report from Future Market Insights predicts the plant-based ice cream market will expand at an annual growth rate of 9.3 percent through 2027. Another local company positioned to benefit from the rising demand for plant-based ice cream is Rosanna’s in Portland. Rosanna’s delivers ice cream Wednesday through Sunday nights to addresses in Portland and South Portland. Last summer, Rosanna’s added vegan flavors made with coconut milk. Rosanna’s owner Salli Wason recently opened a temporary pint shop at 953 Congress St. (near Union Station Plaza) while she looks for a permanent scoop shop location. 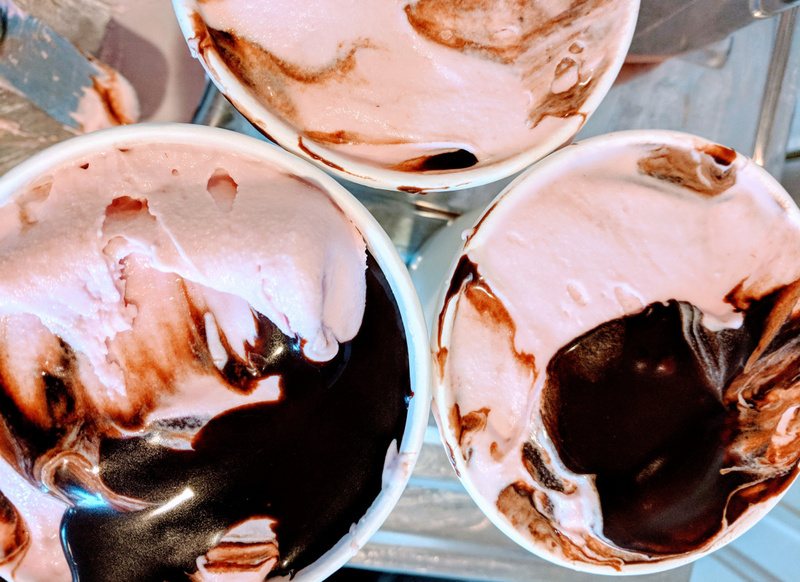 Vegan raspberry fudge ripple is one of the plant-based flavors offered by Rosanna’s, which makes home deliveries in Portland and South Portland. Rosanna’s pints (both vegan and non-vegan) cost $8.99 each with a minimum order of $12 for delivery. Wason said she also has customers who eat dairy but will order vegan pints because they want a flavor that’s only available in the vegan line, such as horchata, fudge ripple or blueberry Oreo. Her customers know “vegan stuff done well can be just as good” as the alternative, Wason said. 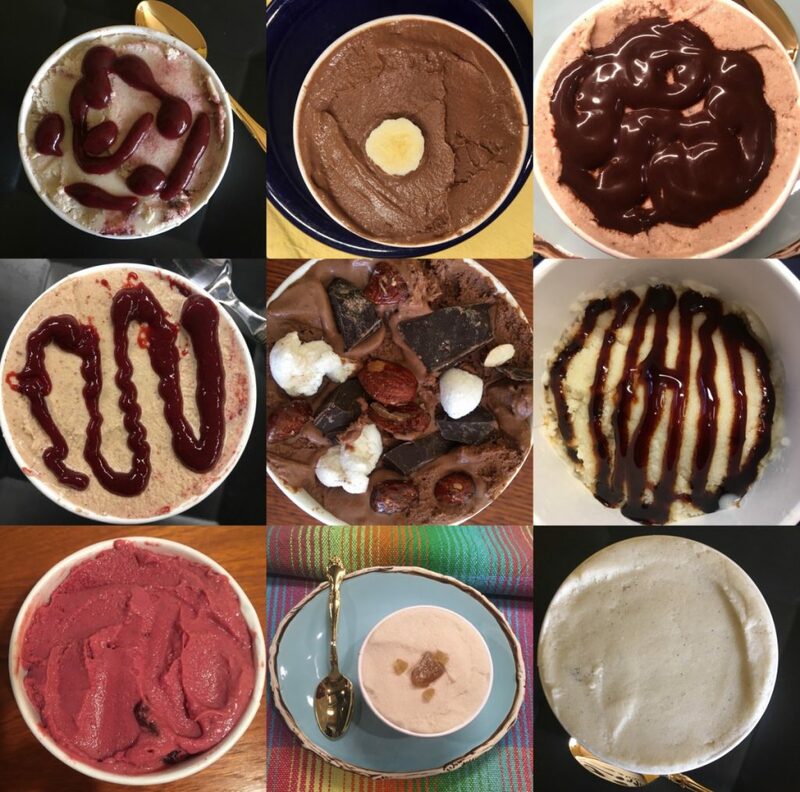 Brunswick-based sauce maker MaineFlavor started selling vegan ice cream last summer and has seen demand grow. Made with organic nut milks from The Whole Almond and its own artisanal sauces, MaineFlavor vegan ice cream varieties include vanilla bean-cashew; spiced cashew-agave with intense cider swirl; and roasted rocky road almond with chocolate chips and vegan marshmallow bits. Over the winter, owner Susan Purcell sold the ice cream at the indoor Brunswick Winter Farmers Market. This summer, she’s been setting up the MaineFlavor cart behind the Freeport Historical Society during warm days and when L.L. Bean is hosting a concert. The MaineFlavor half-pints are also sold at Morning Glory Natural Foods, Rising Tide Community Market in Damariscotta and Handy’s in Yarmouth. The suggested retail price is $6 for a half-pint. Purcell said she’s had interest from other retailers and is ramping up production to take on new accounts while keeping up with expanding orders from the three stores she already supplies. Here in Maine, we’re lucky to have multiple ice cream makers who know how to make dairy-free into a decadent, craveable treat.